The choose of stainless steel to make an artesian well means absolute guarantee of resistance and pipes long lasting. Inox steel main feature in fact is excellent corrosion and mechanical resistance. 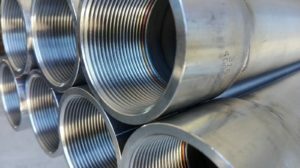 Depending on requested diameter, pipes are made by rolling machine with MIG welding or by forming machine with TIG and plasma welding and are available in AISI 304 and 316 L grade.